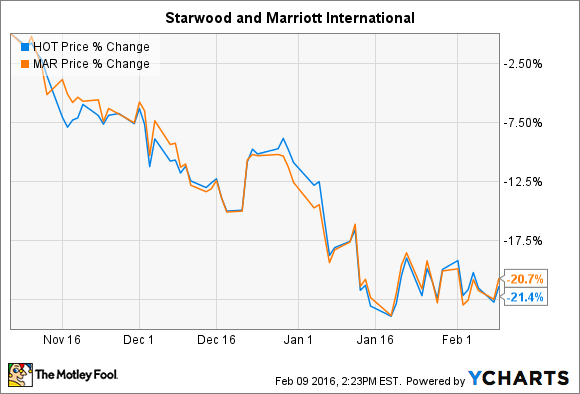 Competitor Marriott International's stock is down, which directly impacts Starwood Hotel investors. 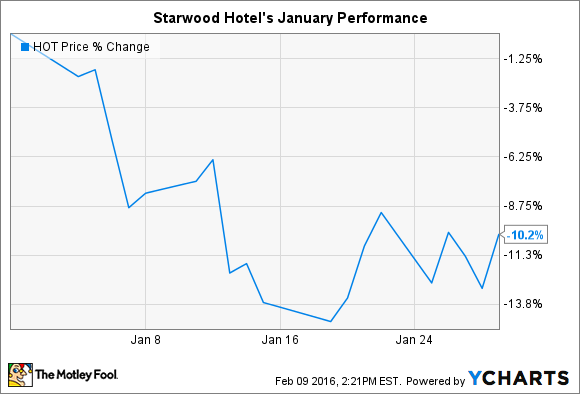 What: Starwood Hotels & Resorts (NYSE:HOT) stock fell 10% in January, according to data provided by S&P Global Market Intelligence. The drop put shares at a 16% loss over the past year, compared to an 11% dip in the broader market. So what: January's slip can be explained by changes in the share price of competitor Marriott International (NASDAQ:MAR), which agreed in November to merge with Starwood and create the world's largest hotel operator. That deal tied Starwood's share price to Marriott's because it is funded almost entirely through a stock exchange. At closing, investors will receive 0.92 shares of Marriott for each share of Starwood stock that they own, plus $2 in cash. In effect, that means buying a share of Starwood right now is equivalent to purchasing Marriott's stock. The deal's funding math valued Starwood at just slightly under $80 per share when the deal was announced in November. However, since Mariott's stock price has fallen from the $70-per-share mark back then to $61 per share now, Starwood's value has ticked lower in lock-step with that move. Now what: Both hotel operators will post their fourth-quarter earnings results in the next week. Because of the looming merger, it's Marriott's results that investors should be watching more closely. The hotel giant is expected to post a 5% sales uptick to $3.7 billion when it announces Q4 figures on Feb. 17. Consensus estimates also have earnings improving by 12% to $0.76 per share. Marriott executives projected revenue per average room rising by 5% this quarter, which should power strong management fee gains. Beyond that, investors will be listening for updates on whether the two companies still believe their merger will close sometime before the middle of this year.